The Subaru XV is a small hatchback SUV. With lots of people making the switch to SUVs as their family car of choice, we had to put this little SUV through our BabyDrive paces and see how it fairs as a family car. Will it be a good compromise, especially in the cities where parking is limited but you might want to do a bit of exploring at the weekend?! Let's find out as we put the XV through our BabyDrive testing! We drove the previous model XV six or more years ago back in Melbourne, BC (before child). We took it for a test drive over the weekend in a national park and got locked into a 4WD track!! The park rangers were striking and we didn’t know anything about it. They came around and locked the gates at midday and we were merrily enjoying a bit of off-road ‘chocolate sauce' mud driving! We went to leave to get back to Melbourne to meet friends out for dinner and the gate was locked across! We had no phone reception so couldn’t get any help and no other cars came through this dirt track all afternoon, so we waited hours! In the end we had to walk to find enough signal to make an SOS call to the police to come and cut the lock and let us out!! We missed our dinner out and had no way of contacting our friends to let them know we couldn’t make it! We did have a great XV adventure though!! The Subaru XV had a surprising amount of space inside the cabin. We could fit a 184cm passenger in the front passenger seat with a rear-facing child set behind them and I LOVE the rear cup holders! A perfect fit with most vessels I tested, a well thought-out design. It felt like the cabin space had been stolen from the boot space though, as storage in the boot was very limited. I could only fit eight shopping bags in there! Also in the boot, the retractable blind was very difficult to remove and wield around. The boot door rattled as you closed it and the entire casing shook, having a very cheap feel and sound to it. I LOVED the lack of parking sensors! It meant a quieter and less harassed journey without the constant beeping of most modern cars we drive. If you do want them, Subaru charges $900! Ouch! There is no welcome tune or jingle the XV too, it is lovely and quiet. You do have to have your seatbelt fastened in order for the handbrake to release though. The satnav volume can be altered so that you do not have it blaring out at you and it can be muted when using Apple CarPlay. I find it great having Apple CarPlay in cars. It just takes the confusion out of navigating the media systems and screens because it’s always the same as your phone. However, I found the touchscreen in the XV hard to use whilst driving. The window mechanisms in the XV are very noisy and they close loudly too. As do the doors, they close with a really solid slam that would wake a sleeping baby. I could fit two rear-facing child seats in the back of the XV in the outer seats. There was not enough space in between for a third seat. The ISO Fix connectors were behind fabric straps, which would become worn and old quickly and the layers of seat foam and fabric that have been cut through to expose the ISO FIx connectors is very crudely cut, so you can just imagine how over time this would look rather tatty and fill with crumbs etc. The seats in he model we drove were fabric, with a textured weave that would be awful for getting things out of and wiping clean. I could wear a ponytail! The headrests in the front were very adjustable. There were no air conditioning vents in the back, but the aircon vents in the front did a good job of cooling the whole cab, the controls were easy to use whilst driving and they were well located on the central console. Visibility was very good for the driver, even with two child seats installed. It was much worse for the rear passengers, especially rear facing ones, as the windows slope upwards at the back making it very hard for them to see out at all. The XV drives well and I had no problems whilst driving it. In fact, it was thoroughly enjoyable to drive! You can see that in a place where parking is limited and a little SUV like the XV would be a great choice. If you have front-facing children who no longer require prams and strollers, the XV is a definite contender as the boot space is enough without all the baby equipment and there is a surprising amount of legroom in the cab for growing kids! In the front of the Subaru XV there are two cup holders in the central console. They were well sized and large enough to hold my large décor refillable water bottle and Cheeki travel mug. They also easily held a disposable coffee cup or 600ml water bottle too. The door pockets in the front of the car are not lined and not overly large. They have space for two bottles to sit beside each other but are not deep enough to hold my large décor refillable water bottle and a 600ml bottle rattles around in the space. 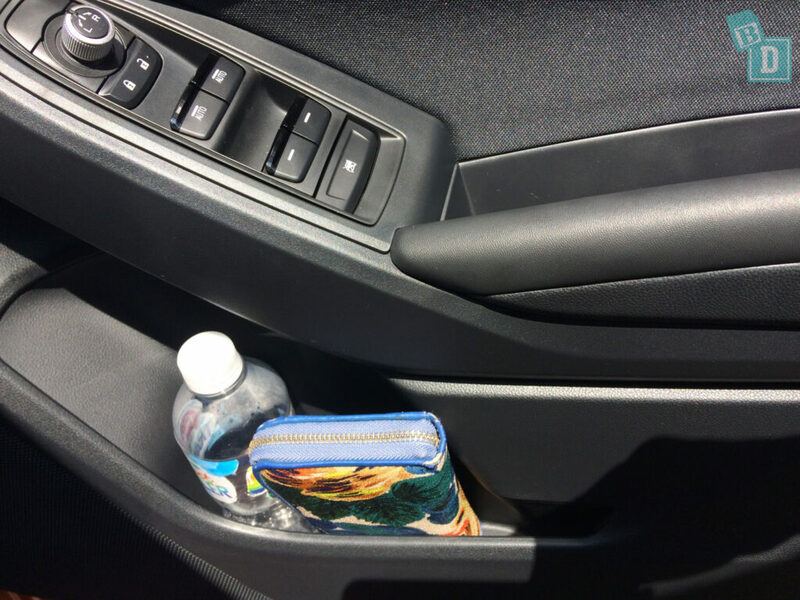 I could put my wallet in the front door pocket on its side but it was a tight fit and standing up the wallet makes it stick out at an angle, so I’d worry it would fall out when getting in or out of the car. 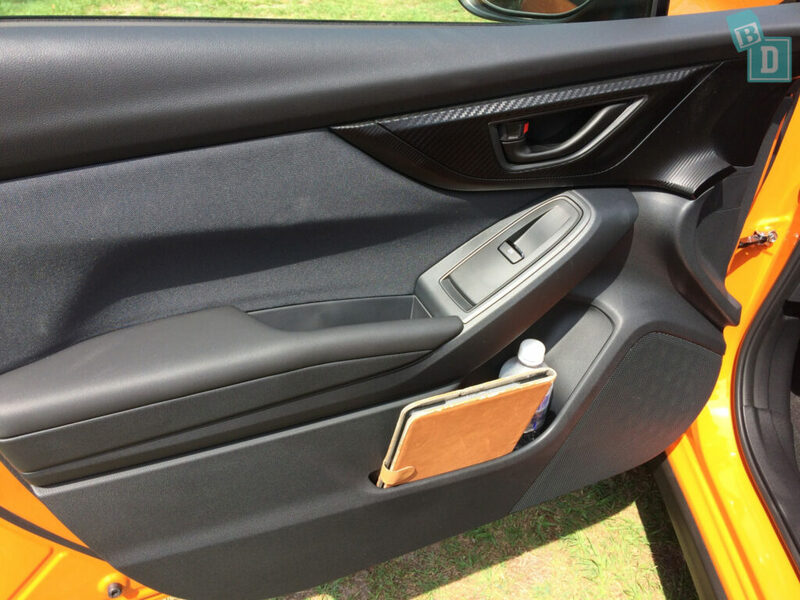 The door pockets have a slit cut out of the back corner of them, which allowed for an iPad to fit in them, on its end, although it does stick out at an angle too. The central console storage box lid doubles as an armrest and inside the storage box is a decent size, square space. There are two USB power outlets and a 12V socket. In front of the gear lever, there is a rubber lined area which is the perfect place to plug your phone in and charge it whilst travelling as it won’t slide about and there is a 12V socket an AUX and a USB socket here too. The XV has no glasses case in the ceiling, so this small rubber lined area has to be used for storing your glasses, your phone and keys too! Mine all just about fit but I don’t like having anything else with my glasses as I don’t want them to get scratched! 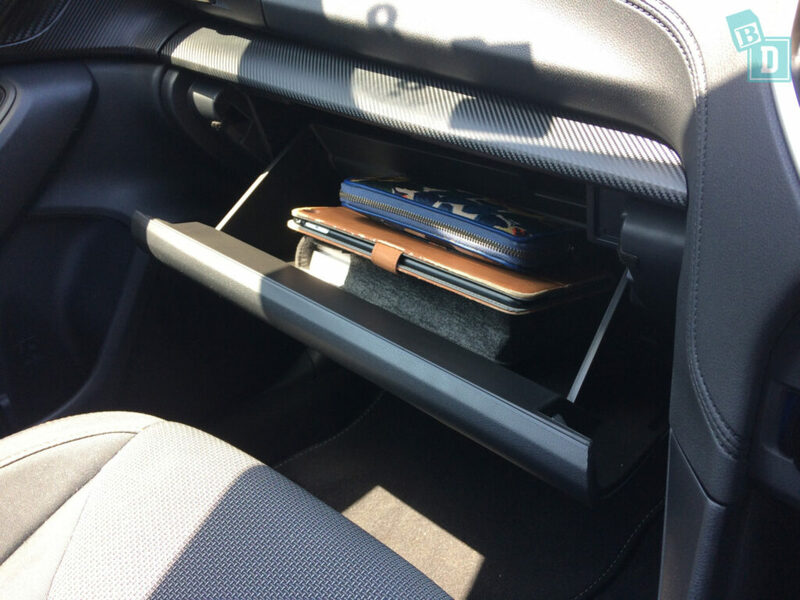 The glove box appeared to be small, perhaps because of the large felt covered manual in there, however, I was surprised to find that both an iPad, keys and wallet fitted in there easily with the manual. 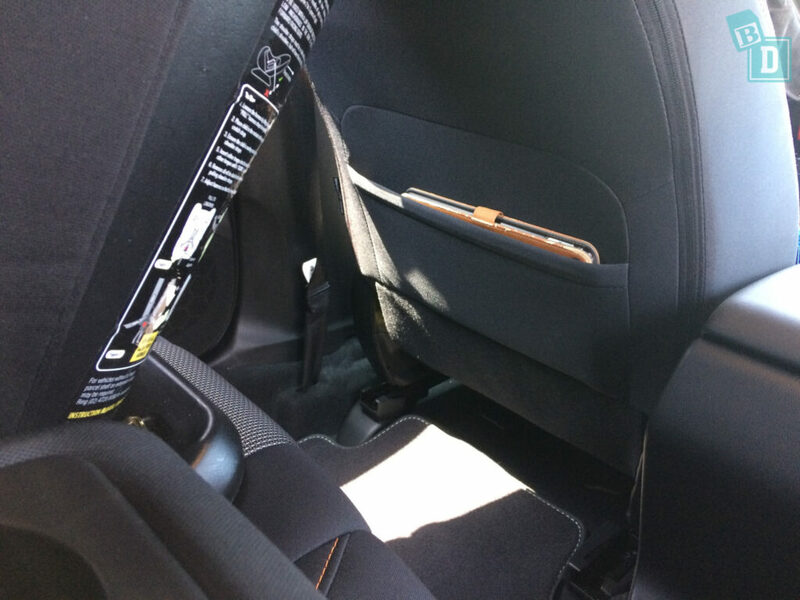 There is only a map pocket on the back of the front passenger's seat, not the driver's side. It is just deep enough to hold an iPad but the top of it is visible so you wouldn’t be able to leave it stored in there. Tulsi has always been a bad passenger; she has HATED the car since the day we brought her home from the hospital!! I have always been against giving children phones or tablets, until I had my own child!! It is controversial and everyone has different opinions and I respect everyone’s right to them. We decided when she was nearly two that we would just try it as we really couldn’t handle the screaming anymore… silence! So…. I find I use the map pockets to hold whatever device I have charged and ready to distract Tulsi if she gets upset in the car when we are travelling. I want to be able to give it to her on our journey and when we reach our destination pop it away somewhere convenient and out of sight in the car and then be able to access it easily if I need it on the return journey. I don’t want to have to lug it around in my bag with me like everything else!! The door pockets in the back would just hold a 600ml bottle and my wallet on its end but again it sticks out at an angle. In the back, there is a fold-down double cup holder in the backrest of the central seat. I really like this cup holder! It is the usual plastic moulded two cup thing BUT each hole has three rubber tabs in it, which hold the drinking vessels in place, so you can use bottles and cups of all sizes! I could put a Sippy cup, a coffee cup and a baby bottle in the holder and they were all held stable. I found the boot of the XV was far too small for a family car! It would hold eight shopping bags on their own or the Mountain Buggy pram with two shopping bags squeezed in around it. With our Mountain Buggy Urban Jungle pram in the boot, the door would only just close and we had to make sure it was in exactly the right position too! So I would suggest testing your pram in the boot of this car before purchasing it. I would suggest only putting a small to medium size dog in the boot with two shopping bags at most. The boot is shallow too. It appears at first that the floor will lift up and there would be more hidden space underneath but it is not, this is where the spare tyre is kept. With the basic stroller in the boot, I could fit five shopping bags across the back of the seats and the stroller across the front. I could not position the stroller in any other place because no other position was wide enough for it. There are little wells on either side at the front of the boot and these allowed for the stroller to fit across at only that point only, otherwise the boot would not have been wide enough for it. The little storage wells are plastic lined so a good place to store wet or sandy items or dirty shoes etc. I could fit the Mountain Buggy Urban Jungle in the boot with two shopping bags around it. Our double stroller would not fit in the boot. The floor of the boot is quite high so you do not have to bend down when putting things in and out of the it. The height also helps when changing a baby's bum on the boot floor, as you do not have to bend too far. However, there is no lip on the edge of the boot to stop baby rolling out! There are no sockets in the boot or any underfloor storage. There is a light on the left-hand side of the boot that you can turn on with a small switch, but this does look and feel quite cheap and flimsy to use. The parcel shelf is a retractable blind from a bar that runs behind the back seats. It is removable by squeezing in one end of it and manoeuvring it out, but I struggled to remove it. It was stiff and difficult to reach and almost impossible to remove without scratching the inside of the vehicle. You would also have to store it in the boot where space is limited! The Subaru boot closed with a really loud bang and a clanging and rattling of the outside panel of the door, making it sound and feel very cheap. I think the model I drove had been in a rear-end collision and hopefully this was the reason, and that your brand new one would not have this problem. But I would definitely check first! The XV model we drove didn’t have parking sensors, which I am always glad about!! I didn’t find at any point I felt I needed them and wished the car had them. The indicator volume is not adjustable but it didn’t need to be. It was a lovely quiet sound that would definitely not disturb a sleeping baby. The Sat Nav volume can be adjusted on a scale of 0 to 40 in the settings on the media screen. It could be muted if using Apple Car Play. The touch screen media system makes a beep sound each time you press it, but thankfully this can be turned off in the settings menu. The media system, although it is not complex to navigate, I found the touchscreen was hard to use whilst driving. It is easy to connect your phone to the XV, it has Apple CarPlay and Android Auto which makes it very simple. I could play the nursery rhymes I had already playing on my phone very quickly through Apple CarPlay as soon as I connected my phone the songs started playing through the car stereo after about three seconds. However, the window mechanisms were quite loud you can definitely hear the electric mechanisms whirring and the rear windows close with quite a thump that would definitely wake a sleeping baby. The doors open quietly but they shut with quite a solid slam the boot door definitely closes with a noise that with disturb sleeping baby it is a loud slam and then the shaking of plastic panelling. Both the doors and windows can be locked from the control panel on the drivers’ door. There is automatic engine cut out you can turn this off with an easily located button by your right knee; you have to select this for each journey. The Subaru XV would not let me drive off without the driver seatbelt fastened. It would not release the handbrake even if I did it manually; you have to have your seatbelt fastened for the car to move! If someone in the XV takes off their seatbelt off whilst the car is driving then a big red flashing symbol comes up on your central display and a beeping sound to let you know that they need to fasten their seatbelt. I was able to come to a stop, take my seatbelt off and get out of the Subaru XV and leave the engine running, without an alarm sounding. However, if I took the keys with me then the car did make a beep warning noise. That said, one time I did pull up once my little girl was asleep and took the keys out of the car with me and she was not woken up by the beeping sound. I think it sounds louder on the outside of the car than the inside. The Subaru XV is a five-seater. There are ISO Fix points in the two outer rear seats and top tether anchor points on the reverse of all three rear backrests. I was only able to fit child seats into the two outer rear seats there was not enough room for a third child seat in the central seat. The ISO Fix points are concealed behind two fabric flaps, positioned between the seat base and backrests. The flaps are just fastened with Velcro which would give a softer feel to the passenger sitting there, rather than a plastic casing which can sometimes be uncomfortable to sit on. However, I feel it would look a bit messy and old over time as it would become worn, the Velcro filled with fluff and crumbs and it could mark passengers' clothing if the flap is not 100% aligned correctly. Where the layers of the seat have been cut through to expose the ISO Fix anchor points, the edges of the fabric, foam and seat cushioning is crude, they have been left raw and I felt these areas too would become filled with child detritus, crumbs etc. There are similar fabric flaps across the join between the centre and outer seats in the same area as the ISOFix flaps, all of which are also going to age badly I suspect. Child seats are not difficult to fit; the ISO Fix points are easy to locate behind the fabric flaps and the top tether anchor point is high enough on the backrest that you can pull the backrest forward and simply stick your hand down to attach the top tethers, or you can post the top tether strap between the backrest and parcel shelf bar, then go around to the boot and connect it from the boot instead. 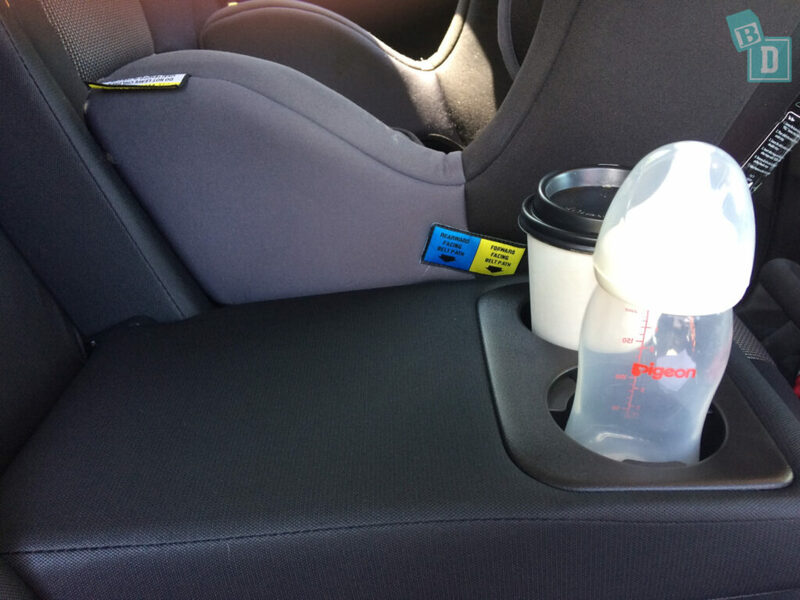 The inside of the XV was spacious, with plenty of room to breastfeed in the back and you could easily post the baby into their child seat from inside and outside the vehicle. Australia being a country of weather extremes; blazing sun and torrential rain means you may find it easier to put bub into their seat from inside the car. If it’s hot you can get the aircon going, cool the car down and not stand out in the heat with the door open while you fasten them in or shelter from the rain and not get soaked yourself whilst you’re doing it. So it is important to test whether bub can be easily installed from either direction. 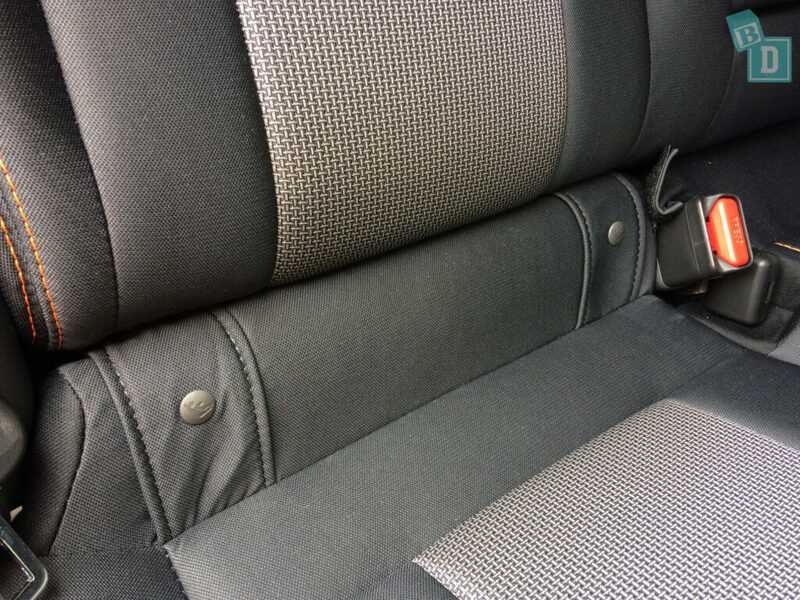 The seats in the model I drove were not easily wipe-cleanable as they were a mix of grey and black textured woven fabric and solid black woven fabric. There are a lot of seams and stitch details that would collect crumbs etc and something spilt would get into the weave of the fabric, making the seats harder to keep clean than smooth leather for example. The front seats in the XV are firm but relatively comfortable. They can be raised up and down with a pump action lever on the side of the chair, however, I didn't feel I could get the seat low enough to feel it was in the right driving position for me. When I raised the seat up I felt like I was being tipped out rather than raised up. There is plenty of headroom and legroom in the Subaru XV. I could sit two 184cm passengers one in front of the other or a 184cm front passenger and rear facing child seat behind it with plenty of legroom. The Subaru XV is very spacious inside the cab, it is just in the boot that it lacks space unfortunately. The front headrests are very adjustable, they can be clicked forward in four stages to the angle which is most comfortable for you and allows for a ponytail at different heights!! WOO HOO!! I had spent hours styling my hair this morning to get it just right too… said no new mum ever!!! The steering wheel is fully adjustable up and down as well as in and out. The cruise controls are positioned on the right-hand side of the steering wheel and easily navigated with your thumb and very simple to use. I found it did not hold the correct speed well on undulating roads, especially at lower speeds. There are no vents for the aircon in the back of the car. In the front, there are four vents; two narrow vertical ones in the centre of the dashboard and a larger one at each end of the dashboard. The controls are simple to use and easily adjusted. I found the air conditioning to be adequate for the hot Queensland days and cooled the cabin quickly. The windows are tinted, providing some shade for all passengers. Visibility for the driver is good in the Subaru and with two rear-facing child seats I could still see out well using the rearview mirror, rear windscreen and out of both side windows. The rear windows slope up at the back, meaning visibility for rear-facing children or smaller children would be quite limited. There are unlit vanity mirrors in both sun visors at the front. There are two press-on interior lights in the front and one larger light with a switch in the ceiling for the back passengers, situated between the two front seats. I often will reach back to turn on the interior light if I am driving at night time, I find my little girl gets less distressed traveling at night that way. It helps if I can reach the interior light from the drivers seat so I can turn it on and off whilst driving. I often find my daughter will need it on as we start our journey in the dark but once she falls asleep I can turn it off. There are handles above both backdoors well positioned to hold a child’s toy. The Subaru drives well around town and especially well on open roads where it corners well. It was a car I didn’t have to think about when driving and I think that is important when it’s a family car as we have enough to think about without having to remember to drive really slowly over uneven road surfaces for example in order to not disturb the baby! Visibility when parking the Subaru XV is very good, and the reversing camera is very clear, easy to see and I always felt I could locate the edges of the vehicle. There were no sensors on this model and I didn’t feel it needed as them the visibility was very good. One thing I have noticed since being a mum is I hate it when I reach a destination or get home from being out and Tulsi has either done really well in the car or she is screaming her head off and I have done really well to keep it together for the entire journey (usually the latter!!) and it takes 10 minutes to park the car! It can be really stressful. Usually I dread when we drive big cars and utes as they take longer in our tight apartment block carpark, but the XV was really easy and enjoyable to drive and to park! There are two 12V sockets suitable for plugging in a powered Esky, one in the central console box and one near the phone shelf in front of the gear lever. The general aesthetics of the vehicle are good. The dashboard is a mix of chequerboard and other black textured plastic and rubber surfaces. The checkerboards are a bit boy racer for my tastes and the orange stitch details on the seating ties with the outside of the car nicely. The doors have a fabric woven panel using the same as the seat fabric. This cheapens the look of the interior and would make that area quite difficult to clean. 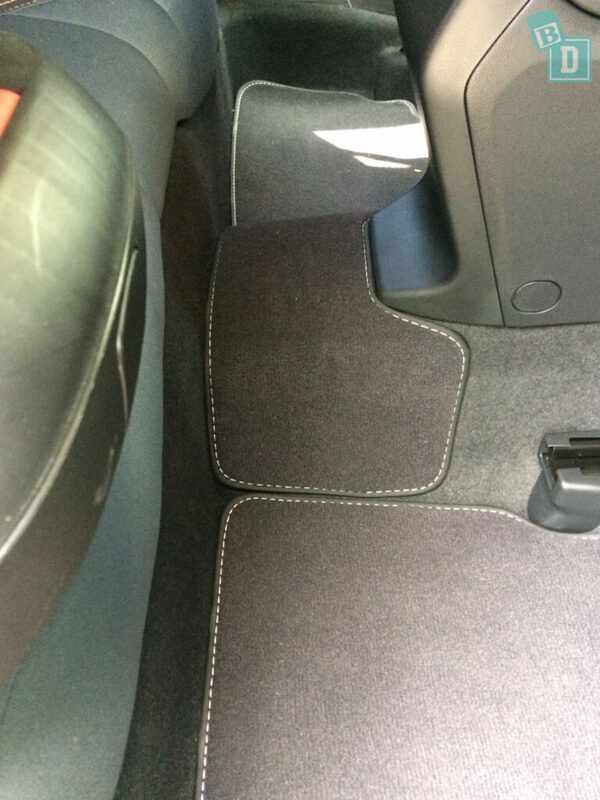 There are floor mats in all the footwells and across the centre in the rear. The Subaru XV is fitted with seven airbags as standard. Front and side airbags for both front passengers and a knee airbag for the driver, as well as curtain head airbags offering protection for the heads of the front and rear side passengers in the event of a side impact. The XV has a five-star ANCAP safety rating, scoring 35.8 out of 37. The Subaru XV scored 14.80 out of 16 in the frontal offset test. Gaining maximum points for both the side impact test, 16 out of 16, and for the pole test, 2 out of 2. Whiplash and pedestrian protection were both rated ‘good’ as well. The XV scored 3 out of 3 for seatbelt reminders as it is fitted with alerts for both front and back passengers seatbelts. The safety features vary throughout the XV range. We drove the lowest spec model the XV 2.0i which comes with the most minimal amount: Electronic stability control, hill holder, rear vision camera, anti-lock brakes, electronic brake distribution and traction control. I actually really enjoyed not having the parking sensors and quite minimal alarms and safety features for our week with the XV! It was great to not be beeped or chimed at and to just use my eyes and the mirrors to manoeuvre the vehicle. As you move up the range to the 2.0iL the safety features increase, adding lane departure warning, lane keep assist, autonomous emergency braking for low and high speeds and front collision warning. The top spec 2.0iS model comes with the full package adding blind spot sensors, brake assist, rear collision warning, rear cross traffic warning when reversing and lane change assist. Some of these safety features are also features that drive me crazy as a mum! Like the lane departure and forward collision alert or the parking sensor beeping sound. I want all the safety technology AND to be able to mute the sound when Tulsi’s asleep!